The C12 Church of St Mary, greatly enlarged in 1852 by J C Buckler, with a chancel of 1870. Parish church, early/mid-C12, altered in the C15 and greatly enlarged in 1852 by J C Buckler and Son; the chancel was added in 1870. Late-C19 glass and wall-paintings by Clayton and Bell; the bellcote rebuilt by M H Medland in 1901. MATERIALS: the C12 parts of the church are built in ashlar; the C15 work is in rubblestone and the C19 parts in rough-faced rubble. 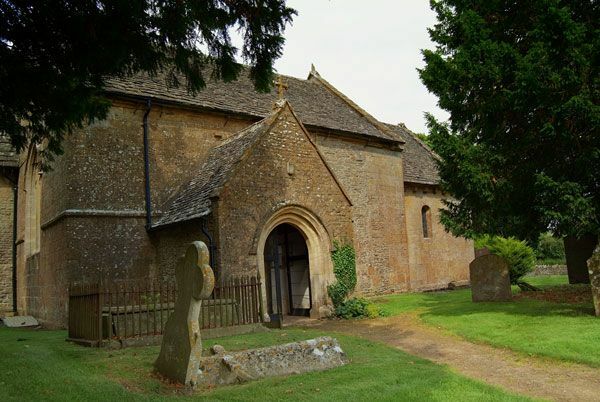 The roofs are of Cotswold stone with coped verges and cross finials. PLAN: the original C12 church, consisting of nave and chancel, now serves as south aisle and chapel to the larger C19 church which projects to east and west. There is a C15 south porch. EXTERIOR: the original C12 church, now forming the south parts of the building, consist of the nave (now the south aisle) and slightly narrower chancel (now the south chapel). There are double-chamfered stringcourses, of C12 date, to west and east ends. The former nave has a moulded eaves cornice. The Norman doorway is at the western end of the former nave: this round-headed opening has two orders with shallow abaci on cushion capitals, the inner order of the arch having a double cable, the outer a roll-moulding on the edge. An inmost order of continuous, chip-carved diapering frames the tympanum – ten stones skilfully wedged together and cut into a flat arch – on which is carved a Tree of Life with a dove pecking at its fruit, apparently unfinished. The doorway is sheltered by the C15 gabled porch with a hollow-moulded doorway. The former nave has a three-light pointed-arched rectilinear west window. To the east of the porch, a late-C15 three-light square-headed window with curvilinear tracery under a hoodmould with hollowed stops, in a deeply-hollowed surround. The C12 ashlar of the south wall is interrupted in the first bay to the west of the chancel where the C15 aisle and rood screen were removed in the late C17; the blocked openings to the rood stair survive. The upper level of the former nave contains a re-set course of chevron, perhaps from the north doorway. The former chancel has a corbel-table to the south wall, with some carved heads. In the south wall of the former chancel, a small round-headed Norman window and a later rectangular 'low-side' window. In the east wall is the late-C15 two-light square-headed former east window; next to the window is re-set a small pillar of chip-carving. The C19 nave, and chancel, are in Early English style, with lancet windows – three stepped to the east end, and a pair to the west. The Norman corbel-table is partly reused on the north chancel wall. The 1901 tripartite bellcote to the west gable is in Early English style: the central pointed opening is flanked by Caernarfon arches, with clasping columns to either side; two new bells were added to the existing one of 1683. The stairs to the crypt are to the south, beside the C12 chancel. INTERIOR: the C12 church retains noteworthy Norman features, principally the former chancel arch. The arch rests on three of pairs of nook-shafts, the cushion capitals having primitive figure carving. The three outer orders of the arch are richly decorated, one with chip-carving, the next with double cable; the outermost order forms a band of twenty-six symbolical carvings, extremely unusual, including human figures and animals, interspersed with patterns. The south window of the former nave, now the south aisle, has an image bracket to its east splay. The arched south window in the former chancel, now the chapel, has rere-arch to the inner angle of the splays, with carved bases and capitals to the shafts. The roof of the former chancel has a roof of delicate arched braces joined to coupled rafters, possibly medieval. The floor is laid with Victorian encaustic tiles. The old and new naves are separated by a two-bay pointed arcade with round columns and responds; both parts have open-trussed roofs, that to the C19 rests on moulded corbels. There is a squint, with a segmental-pointed arch, between the former nave and the C19 chancel. The C19 chancel arch is set within a segmental-pointed frame; within this is an openwork wooden screen with ogival panels, made in 1925 by F E Howard; to the north, the wine-glass pulpit is of the same date, also by Howard, with linenfold panels. The tripartite stepped lancets forming the east window are set within a rere-arch, with shafts separating the lights. There is a niche with picina, with paired trefoil-headed arches, to the south. The chancel is decorated with a narrative scheme of 1883-4 (the north-west window being of 1874) by Clayton and Bell, in which wall paintings combine with the stained glass to tell the story of the Passion. The tri-coloured scenes are set in painted architectural Gothic frames, with text beneath. The chancel has arched braces to the roof. The sanctuary is protected by a low wrought-iron screen with timber rail; there are geometric and encaustic tiles to the floor. The organ is set within an opening with a segmental-pointed frame between the new and old chancels. Glass in the church, other than in the chancel, is also by Clayton and Bell, dating between 1866 and 1884, the majority belonging to the 1883-4 phase of work. The exception is the east window of the former chancel, dated 1841, with vesica panels containing the Virgin and Child and the arms of Christ Church, Oxford. The C15 font was re-cut in C19; it is of octagonal chalice-type with Perpendicular style traceried panelling containing shields bearing the Saltire Cross of the Slaughter family. The church is built near the site of a possible Romano-British settlement; later a possession of Notley Abbey, Buckinghamshire. The early parts of the church date from the early/mid-C12. Alterations were made in the C15, including the raising of the roof, the insertion of Perpendicular windows, the addition of a short south transept, and probably of the south porch. The church was altered circa 1683 at the direction of Sir Robert Atkyn, then lord of the manor, who had a C15 south transept and rood stair removed. In 1852 the church was greatly enlarged by J C Buckler and Son. The chancel was added in 1870, and enriched with stained glass and wall paintings in 1883-4. The bellcote was rebuilt as a memorial to the Rev. David Royce, an enthusiastic amateur archaeologist and antiquary, and rector from 1850 to 1901. * Group value: with the base of the churchyard cross, dating from the C15 or early C16, and the Fenwick chest tomb of circa 1924 by Guy Dawber, both standing in the churchyard, and with the large multi-phase scheduled area immediately to the north and east of the churchyard, which includes Roman remains.